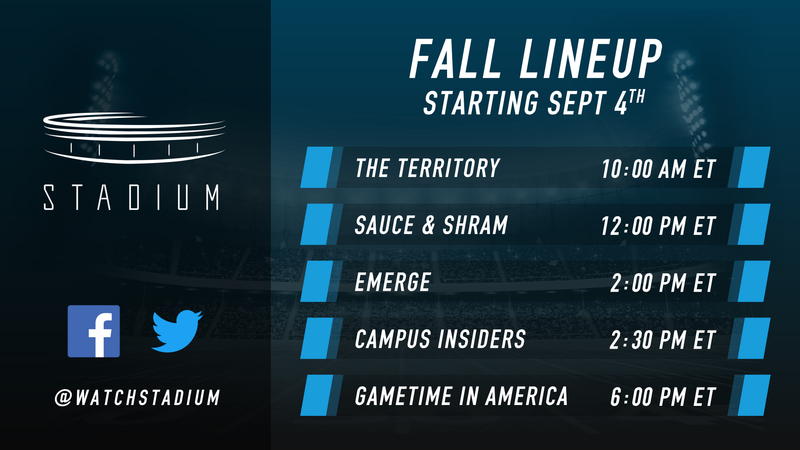 CHICAGO – Stadium, the first 24/7 multi-platform sports network, today announced an expanded fall lineup that will debut Tuesday, September 4th exclusively on Stadium. The lineup is highlighted by the addition of The Territory, a new weekday morning show hosted by Michael Kim and featuring Stadium’s recently announced lineup of insiders, including Shams Charania (@ShamsCharania), Jeff Goodman (@GoodmanHoops) and Brett McMurphy (Brett_McMurphy). Airing weekdays (10 a.m. – 11 a.m. ET), The Territory will set the editorial cycle for the day with a fast-paced, expansive look at the sports landscape, featuring news and storylines from coast-to-coast. Hosted by renowned sports news personality Michael Kim (@MichaelKimHD), The Territory will break and develop news told through the richly sourced lens of McMurphy, Goodman and Charania, along with in-market experts to offer unique and authoritative coverage. Airing weekdays (12 p.m. – 1 p.m. ET), Sauce & Shram showcases an irreverent and interactive conversation between Dave Ross (@DRossSports) and Tyler Jacobs (@TylerJacobsSTAD) along with user generated social media commentary and callers. Sauce and Shram features a range of live guests from Dana White to Sloane Stephens to Ice Cube. Come for the sports, stay for the fun. while also featuring interviews with players and coaches throughout prep sports. Emerge will also become your new home for recruiting news, producing daily segments on where tomorrow’s stars are headed. Emerge will be hosted by Amina Smith (@AminaJadeTV) and Michael Felder (@InTheBleachers) and feature regular guests and experts from across the high school sports landscape. Airing weekdays (2:30 p.m. – 3 p.m. ET), Campus Insiders will continue to focus on college conferences across the nation, including the SEC, Pac-12, Big 10, Big 12, ACC, Mountain West, Conference USA, Patriot League and the West Coast Conference. Each day, a different conference will be highlighted with exclusive interviews, Top 25 breakdowns, game picks and more. Kristen Balboni (@KristenBalboni) will anchor the coverage, and be joined by various Stadium insiders and analysts. Airing weekdays (6 p.m. – 7 p.m. ET), Gametime in America sets the live sports scene as viewers will navigate in real time through the landscape of sports in America. Gametime in America will reach beyond the coastal headlines and spotlight the overlooked stories, teams and athletes that are worthy of national audiences. Gametime in America will feature various Stadium talent including Dave Ross, Tyler Jacobs, Kristen Balboni and Michael Felder. In addition to the live studio content, Stadium will air 32 regular season college football games, 22 high school football games and over 1000 events from various Olympic sports.